Brace yourself, it’s gonna be a hot one. With temperatures wavering in the ’90s this weekend, some people might not want to leave the sacred space of their air conditioning, despite how many of these very same people’s fashion choices reflect that they actually love the ’90s. 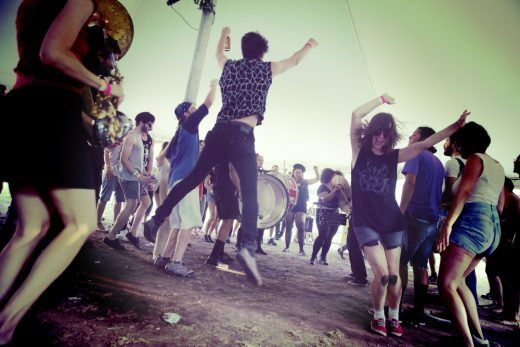 But for those who want to be so occupied you forget about your melting and/or boiling flesh, here are four music and art festivals this weekend to spend your day and/or night at. At the Vander Ende-Onderdonk House, 18-20 Flushing Ave, Ridgewood. July 16-17. Doors at 1pm, shows begin at 1:30pm. $38 for a weekend pass, $24 for individual days. More info here. 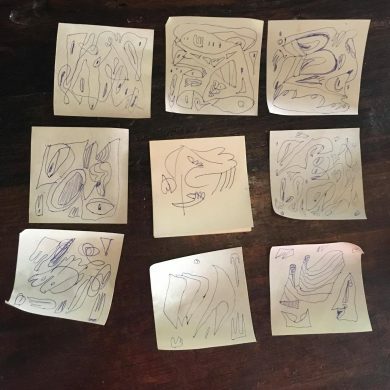 This weekend DIY music and art festival, presented by The Sky Report, BirdDog Promo, and Supercrush Studio, spans 2 acres of the historic Onderdonk House in Ridgewood. The house is a refreshing alternative to the typical music venue, with indoor and outdoor components, including a bonfire pit and picnic areas. No stranger to nature, it once hosted an immensely large tree trunk, and the grounds currently sport a large stone that purportedly marks the dividing line between Bushwick and Queens. 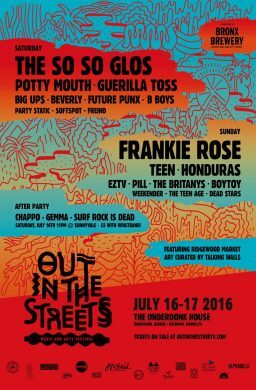 The lineup is a rockin’ sight to behold, with local faves like Guerrilla Toss, Pill, Future Punx, and Potty Mouth. Saturday’s headliners are true DIY darlings The So So Glos, fronted by two brothers from Bay Ridge who not only were behind the first iteration of Market Hotel with Todd P, but also gave birth to Bushwick’s Shea Stadium. Sunday’s headliner is songwriter Frankie Rose, who was an original member of Dum Dum Girls and the Vivian Girls. Talking Walls has curated art by a bevy of local artists, so there’ll be no shortage of stuff to look at and listen to. If you’re looking to continue the festivities into the night, there will be an afterparty at nearby Sunnyvale, which is just $5 if you still have your wristband on. At The Hollows, 151 Bedford Ave, Williamsburg. Saturday, July 16, 2-8pm. $10 suggested minimum donation. More info here. 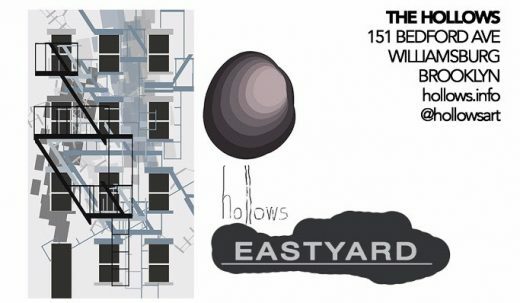 Large-scale art gallery The Hollows, who recently departed their Bushwick brownstone space and moved into a 5-floor Williamsburg townhouse, has announced a new outdoor arts programming series on weekends. The summer series is occurring in conjunction with new art installations in the townhouse’s garden. Setting the scene will be Kiichiro Adachi’s “kinetic disco ball pieces,” Halaburda’s “vertical city mapping mural” that incorporates shadows of the back facade’s fixtures, and a repurposing of a permanent Hollows piece previously found indoors, by André Eamiello. Tomorrow, they’re rolling out a new sound-focused series for July (August will focus on screenings, and September will feature talks) that explores the varying ways one can manipulate electronic music. The inaugural lineup features Adam Hirsch, Multa Nox, Eve Essex, Trent Gill, and James K. After the jams are complete, they’ll be doing weekly evening yoga sessions from 8:30-9:30pm, led by Teresa Zaga. It’s a good chance to make yourself zen before subjecting yourself to stepping out into the Williamsburg on the weekend. At The Park Church Co-op, 129 Russell Street, Greenpoint. Saturday July 16, 2-10:30pm. $10-25 suggested donation. More info here. For those who have been partaking in the recent protests against the all-too-frequent instances of police brutality, this is a weekend event where you can have art as well as activism. A slew of artists and musicians have banded together for a jam-packed benefit show in three parts at a Greenpoint co-op. From 2-7pm, there will be back-to-back music from over 15 artists, including M Lamar, IDIO Gallery sound art curator and DJ Maria Chavez, and TV On the Radio’s Kyp Malone. During this time, the venue’s basement will also be open, with practitioners offering yoga, meditations, and massage. From 7-7:30pm there will be a silent candlelight vigil for the victims of police violence. Afterwards, the tunes heat back up with electronic and psychedelic music by Benny Boeldt, Stehla, and St James And The Apostles. 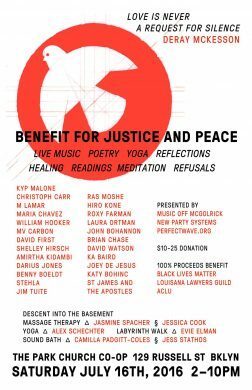 Despite the suggested donation, don’t be skimping: all proceeds from the event will go to Black Lives Matter, the ACLU, and Louisiana National Lawyers Guild. At The Glove, 885 Lexington Avenue, Bushwick. Saturday, July 16, 8:12pm-2:34am. $5-10 sliding scale. More info here. “Weirdwick Tweeniversary descends from the never-sphere to undulate in rapid breathing-like pulses for the pus worshiping monsters of the red dream room,” reads the event description for this multifaceted and lengthy performance festival at The Glove, the new space from the folks who brought you house show spot Bohemian Grove. Starting promptly (they’re very clear on this) at 8:12pm, this show is a nearly nonstop (save for one intermission) banquet spread of multidisciplinary performance, with noise, drone, poetry, comedy, looping, punk, clown acts, live insect shows, spoken word, and more. It’s not an all-day event, but it’s stuffed with enough odd to feel that way. Each performer gets a 20-minute slot, which is fairly generous and will make for a long, interesting night. This one is indoors and during the evening, so the chances’s it’ll be blazing are slightly reduced. Of course, that depends on what kind of blazing you mean.